Over the past decade, forensic psychology has grown rapidly as a subject, with an increasing number of forensic psychologists working in demanding roles in prisons, secure training facilities, and high, medium and low security healthcare facilities as well as other parts of the criminal justice system. This Dictionary is designed to meet the needs of both students and practitioners. 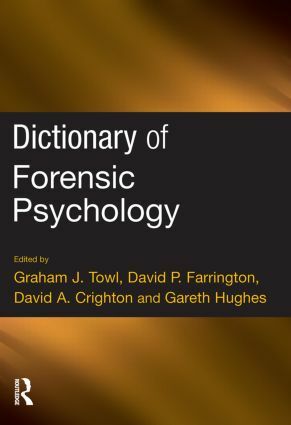 It contains approximately 100 entries on key terms and concepts, arranged alphabetically and contributed by leading academic and practicing forensic psychologists.